Join your fellow Rotarians and friends for an ugly holiday sweater and white elephant gift exchange potluck. 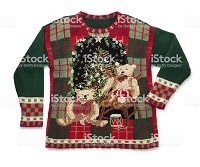 Prizes will be given for the ugliest holiday sweaters. This is a great opportunity to socialize with your fellow Rotarians and meet other members of our Club.